Parents are up in arms after being told their children will have to use gender-neutral toilets in a new school building. A new building at Buxton School in Leytonstone, East London, has been fitted with the toilets, for use by children aged eight and above. Headteacher Kath Wheeler says the facilities will create ‘safe spaces’ for pupils. 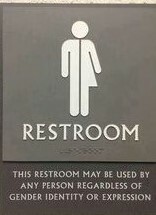 There has been an outcry amongst parents, who fear the toilets will lead to children being sexualised at a young age. Another parent said: “Why would you want girls and boys in the same bathroom? Privacy seems to be out of the window nowadays.